Last year, we at Stillwater offered a review of the state of ethanol-free (or E0) gasoline in the U.S. Since then, we’ve learned a great deal about the market which we will share in this updated article. We start with some background: The Federal Renewable Fuel Standard (RFS) requires increasing levels of renewable fuels to be blended into transportation fuel. Ethanol provides the largest share of the renewable fuel pool so that nearly all of the gasoline sold in the U.S. is 10% ethanol. With this volume, it would be easy to assume that there is little to no ethanol-free gasoline on the market. As part of Stillwater’s Energy Policy practice, however, we have been studying the issue of E0 market volume; it’s not as small as you might think. 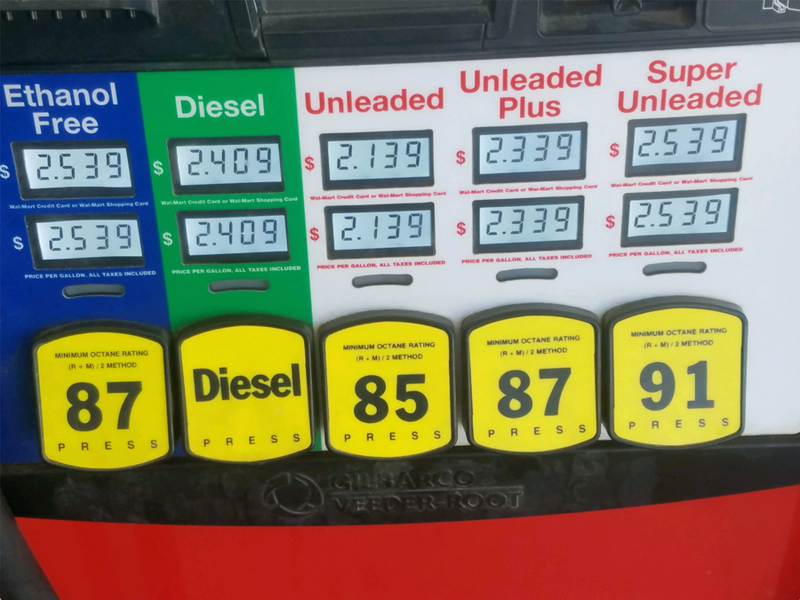 While most gasoline in the U.S. is blended with 10% ethanol, there are also minor volumes of E85, and a very small volume of E15 on the market. All along, E0 has been available for sale to consumers, but it is difficult to tell how much. The Environmental Protection Agency (EPA) estimates about 200 million gallons per year (mgy) of E0 is available, which is about the same as their E85 volume estimate. In an August 31, 2017 letter to EPA, however, Magellan Midstream Partners states that the “net daily average of E0 loaded from Magellan’s pipeline systems, independent and marine terminals through July 2017 is 52,000 barrels per day. When compared to EPA’s revised national estimate of E0 volume in 2016 of 500 million gallons or 32,615 barrels per day, Magellan’s YTD 2017 daily E0 volume average is almost 40% higher than EPA’s proposed national volume estimate. Far from relatively minimal amounts, our data illustrates that substantial use of E0 continues today in the markets we serve.” Meanwhile, the Energy Information Administration’s (EIA) estimate is much higher, at 5.3 billion gallons per year (bgy) of E0 available, approximately 3% of the gasoline pool. It should be noted however, that EIA’s estimate is based on the difference between ethanol supplied and the total ethanol used in the fuel pool and not by surveying the market. Upon surveying the market, we’ve found that in conventional gasoline markets, up to 10% of the fuel sold in these areas is E0, averaging 7-8%. We’re also told by marketers in Iowa that 14% of the gasoline sold in that state is E0. Both of these survey data points indicate that the E0 market share is even higher than EIA’s 3% estimate. We have also learned from many marketers that even if they are not already in the E0 market, they are interested in ethanol-free gasoline and find that the volume and margin is attractive enough to dedicate a tank and nozzle to the product at their stations. Through a small price-sampling survey of stations in North Carolina – one of the states in which E0 is most popular, Stillwater found the margin between Premium E10 and E0 can be as high as $0.67 per gallon. On average, in our small sample, E0 sold for $0.51 per gallon more than Premium. So who is buying E0? Unfortunately, EIA is not able to quantify the volume of E0 sold by market segment or location, but we do have some clues. Small or specialty engine users (i.e. marine engines and chain saws) seem to be making up a large segment of the market. EIA estimates that in 2015 recreational boats used about 2 billion gallons of gasoline, which in most cases was E0. This estimate is 10 times larger than EPA’s E0 estimate. E0 also seems to be popular with a growing population of on-road users, and we have found strong markets for ethanol-free fuel in markets like Wisconsin, North Carolina, Oklahoma, New York, and Florida. And who is selling E0? 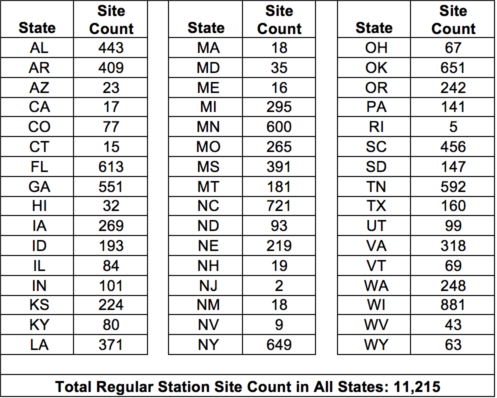 No government agency currently compiles a database of stations with ethanol-free fuel, but pure-gas.org offers a crowdsourced “definitive list of stations that sell pure, ethanol-free gasoline in the U.S. and Canada.” Upon analyzing the Pure-Gas database, we find that there are more than 12,000 sites across the U.S. currently selling E0, and only about 1,000 of them appear to be marinas or airports. That leaves more than 11,000 regular gas stations selling ethanol-free gasoline. Table 1 below breaks out the number of sites by state. Almost half of the stations selling E0 are unbranded, and the top independent brands (by station count) include Stewart’s Shops, Casey’s, Murphy, Wawa, and Maverick. In the branded arena, the top sites are owned by independent marketers operating under the licensed brands of BP, Shell, Citgo, Cenex, and Phillips 66. 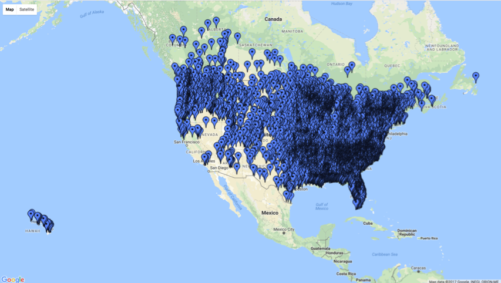 Interestingly, there are 200 Chevron- and Texaco-branded stations selling E0, mostly in the Southeast, Pacific Northwest, and British Colombia. As you can see in the map below, however, stations selling ethanol-free gasoline are spread all across the U.S. The fuel has yet to achieve market penetration in most reformulated gasoline (RFG) areas. Without the ethanol, where’s the octane coming from? Marketers seem to be blending regular and premium CBOB together to make the desired octane of the product they offer for sale. A 50/50 blend of 84 octane regular CBOB + 90 octane premium CBOB (East of the Rockies) should create an 87 octane gasoline. (Caution the BOBs are not always at the octane rating assumed in the previous statement because of local or regional BOB blending practices). We at Stillwater would appreciate any feedback that marketers would like to offer about product line. Please contact Dave Hackett (dhackett@stillwaterassociates.com) with any comments or feedback.